Every holiday I try to make something special to deliver for the older folks in our church. 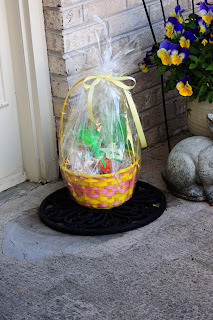 This year we decided to make Easter baskets. 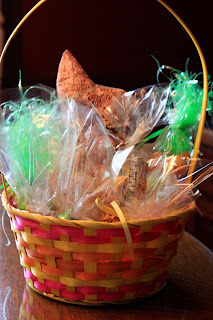 I made Easter Egg cake balls, sugar cookies, toile bunnies, marshmallow peeps and some Easter eggs. I filled some carrots full of Jolly Rancher jelly beans. I got the bags at Walmart and they turned out cute. 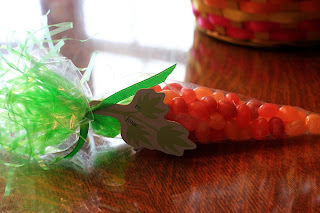 I also found some Easter candy corn and filled them in another carrot. We left some at their front doors. We delivered some personally. 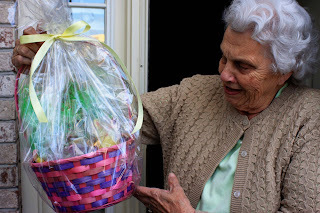 This wonderful lady told us it was her first Easter basket in 60 years. Some made their sister's wait so they could see their basket. You can see my bunny helper. I have found that these special treats mean a lot to these people. Sometimes it is the only holiday gift they receive. Honestly, it is not expensive, doesn't take all that long and means so much to them, that I am so glad I do it for them. Besides, you know how much I love to bake and goodness knows I need to share my treats. Okay the photo of the white-haired lady literally has my eyes full of tears. You are a wonderful soul, Cynthia and I love you to pieces. That post made my morning! And you've got two mighty cute helpers! 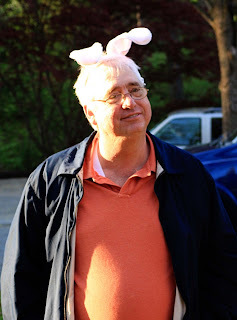 I love the Easter spirit. Thank you sharing your beautiful example of Christian charity. You are truly inspiring to me. What a wonderful thing to do at an unexpected time. Thanks so much for sharing the pictures. Definitely put a smile on my face and made me wonder what I could do to bless someone else today, too. My husband, Michael, works (and plays golf) with your husband. Michael brought me one of your cards and told me about your blog. I must say I have enjoyed it so very much! You inspire me to be more creative everyday. I hope that some time in the future we could meet!!! P.S. I made your slider recipe, and my entire family LOVED it!!! That's is such a wonderful story, I know you made some people very happy this Easter! What a beautiful thing you did!!! 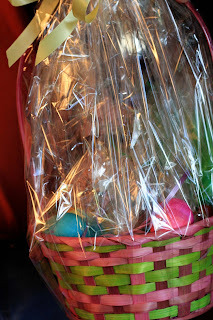 I love the baskets and giving them to the elderly people!! Sometimes it's the little gestures that you do that makes someone's day so special! Great idea!! What a wonderful idea - I am sure you made many Easter mornings! Oh that was so precious! What a wonderful post, Cynthia! You are such a special lady to do this for these folks! 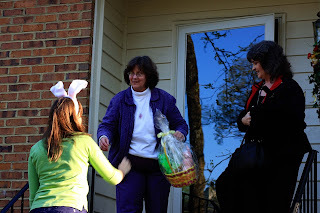 Your bunny helpers are so cute and I love the picture of the lovely lady with her basket! What a sweet thoughtful thing to do for your elderly church folks. I'm sure it blessed you as much as them!